HEVC is a successor to the well known H.264/MPEG-4 AVC video compression standard. HEVC promises the same level of picture quality as H.264/AVC, however, there will be better compression so the file size can be smaller. This is important when dealing with 4K or UHD media. As the resolution increases, the file size increases along with it. Although there are now few devices supporting HEVC, Plex won’t let you down ever with supporting both H.264/AVC and HEVC/H.265 direct playing.
" I have been waiting a long time for Plex to be able to support HEVC. But alas, encoding a movie in x265 took 3 days to encode on my 8 core 32GB computer. I have a video card (GeForce GTX 960) that supports hardware encoding, but I was unable to find software to support the encoding." Now, there is a new version of Pavtube Video Converter Ultimate (trialware) that supports Nvidia H.265, Nvidia H.264 and Intel H.264 hardware encoding as well as other common encoders. You can now encode a 1.5 hour 1080p video in HEVC in about 20 minutes. And the quality will be very good and am very impressed. If you have a Nvidia video card that supports H.265 encoding (Kepler), you might want to check it out. H.264 hardware encoding is supported on many of the older Nvidia cards. To use NVIDIA HEVC hardware encoding, you have to have the appropriate hardware. You can see if your Graphics Card supports NVIDIA HEVC CUDA acceleration here. Step 1: Add any Video in the Program. Install PavTube Video Converter Ultimate and open the program. To add videos, click “File” menu at the top of the main interface. Under that, click “Add Video/Audio” or choose “Add from Folder”. Choose the video which has to be converted. At the bottom of the main interface, select “Format” and choose H.265 HD MP4 video for Plex. 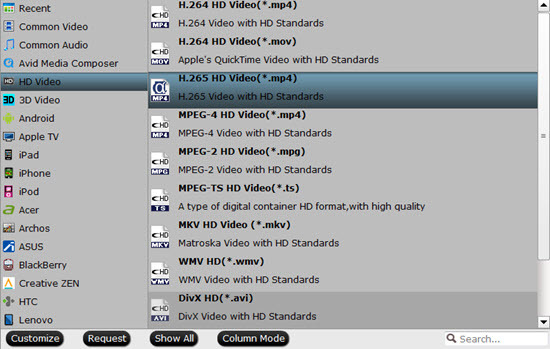 If you don’t HEVC video, you also can choose any output format from the drop-down menu. It has a huge resource of output formats such as Custom videos, common videos, Common Audio, Fina Cut Pro, HLS Streaming, HD/3D Video and many more. Step 3: Using NVIDIA HEVC Encoding to accelerate the speed. Now, move your cursor to “Tools” button on the top of the main interface to choose “Options”. Then you can enable GPU acceleration. This entry was posted in Plex, Video Conversion. « How to Rip 4K Blu-ray to multi-track MP4 Files?